Firmware v.1.03 adds “fulltime” synchronization provisions to allow for engine sync on twin engine Yamaha jet boats when the speed control is not being used to regulate the boat speed (i.e. “OFF” mode). 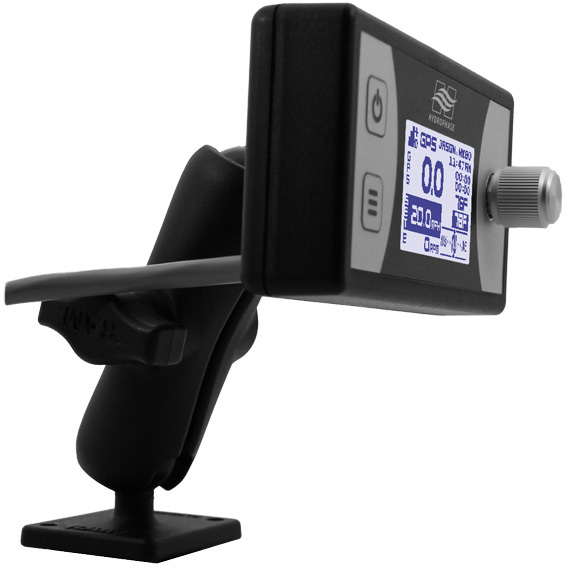 This allows the driver to manually control the throttle of the boat, while Ridesteady keeps the engines in sync. Additionally, a “gate” has been added to prevent Ridesteady from being powered off before 1 minute has elapsed from engine stop. This is to prevent “check engine” lights from appearing if the user forces Ridesteady off before the engine’s ECMs have powered down. [AUSTIN, TX] March 7, 2017 — Hydrophase (http://www.hydrophase.com) today announced the launch of its Ridesteady boat speed control system for Yamaha jet boats. Yamaha jet boats are popular, spacious, high value boats that have uprooted the traditional sterndrive market. However, they can be difficult to control to a precise and reliable speed, particularly when towing a wakeboarder, surfer, skier, etc. This can turn a leisurely day on the water into a stressful one for both driver and rider. February 1, 2017 — External displays with rugged, dual-adjustable aluminum mounts are now available for purchase with Ridesteady Speed Control. External displays are particularly useful when boats have gauges that are not easily removable, or incorporate multiple functions into one gauge. All of the same features and functions that the traditional round displays have are built into the external display. [AUSTIN, TX] January 29, 2015 — Hydrophase (http://www.hydrophase.com) today announced the release of the industry’s first boat speed control with dual, simultaneous GPS and GLONASS technology. “In keeping with our commitment to lead the market, we’ve harnessed the power of two separate satellite systems to provide unprecedented signal strength, reliability, and precision control. We’re excited to get the latest version of Ridesteady in customers' boats,” said Justin Muessig, CEO of Hydrophase LLC. I was able to take the boat out yesterday and test the Hydrophase system. IT IS PHENOMENAL!!! It worked perfectly with no issues! I love it.